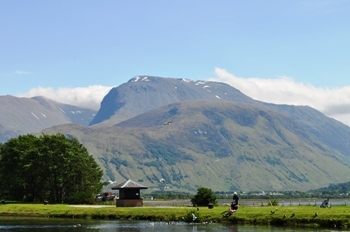 The Southern Highlands of Scotland encompass the country south of a line drawn roughly from kyle of Lochalse on the west coast to Inverness on the east and down to follow the upper half of the Spey Valley west past Loch Laggan to Fort William and Glencoe. On the east coast Inverness is by far the biggest town in the Highlands, a good base for day trips and a jumping off point for the more remote parts of the region, To some extent, the area around the Moray Forth is a commuter belt for the region, but it also boasts a lively coastline and some of the regions best castles and historic sites, the gentle undulating green landscape is well tended, good looking and tranquil, a fertile contrast to the mountains that virtually surround the area. Slicing through the region, virtually cutting the north of Scotland in two, the Great Glen, formed by volcanic action some four hundred million years ago is now filled with three Lochs, Loch Ness at almost thirty miles is by far the longest, Loch Lochy, and the sea loch Loch Linnhe. Loch Linnhe forms a natural barrier to the mysterious and remote Ardnamurchan Peninsula, which offers a massive range of fantastic scenery, with expanse wildlife and flora and crofting villages scattered around the area. Further north of this coast, the Kyle of Lochalsh is the easiest access point for the Isle of Skye, but to get there you have to go back on yourself through Fort William, Glen Shiel and Glen Moriston, magnificent areas with plenty of things to do. Unless you make your way to Mallaig and travel by boat up the sound of Sleat. On the opposite of the Glen, the Monadhliath mountains make the boundary with the Spey Valley, this magnificent open valley provides lots of outdoor pursuits and the awe-inspiring Cairngorm mountains makes the Cairngorm National Park, and one of the better known national parks in the UK, the Spey valley also offers an abundance of Whisky Distilleries and plenty of cottages, hotels and campsites to have a great Holiday in Scotland.